OK Girls-its time for all of you to join in the Challenge!! This should warm you up on a Monday. Each month the PCS design team has one member issue a challenge for the others. This week it was my turn. 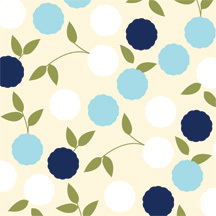 I chose this as my inspiration of color: white, pale yellow, olive, Caribbean and navy. Just use whatever colors you have that are close. Now the additional part to the challenge is you HAVE to use a CIRCLE element! That means a button, tag, paper-something round! Sky is the limit! OK! I hope you have fun with this. Send us a link here to your creation. ALSO-Be sure to check out all the DT member’s blogs to see their take on the challenge! I think these are such happy colors. Perfect thing to perk up a Monday! 43 Responses for "Not so Pink Cat"
Hope you are feeling better~~Get well quick without sharing it back to one of the kids or DH. Lauren, I especially love how you crafted flowers to match your DP!! This is a fabulous card and your copic coloring is awesome. I love your card! And those bridal flowers are too cute. I’ve been looking and looking for some, but since we don’t have a Michael’s here (none in Hawaii-gasp!) I haven’t found them. I’m probably going to end up ordering them online if I can find them that way, or picking up a ton of them when I get back to the mainland… ANYWAYs, thanks for the wonderful eye candy. Have a happy monday! Your card is precious! I love those flowers since you introduced me to them…I just don’t remember I have them, but when I do, watch out! What a great sketch! I’ve jotted it down and hoping I can try it out later today. I love yours and how you made the flowers to match purrr-fectly! Hope you’re feeling better! Talk to you later! Sweet card, Lauren! That’s one of my favorite images of Pink Cat! Thanks for the fun challenge! Cute cute cute Lauren! She is coloured so beautifully!!! Looks like a fun challenge and sketch! Lauren…colors….LOVE them…sketch…TERRIFIC…card…WOW! Lovin’ the Pink Cat stuff! Hope you are feeling even better today! I love these colors together. I think when my senior moves out next year, I will paint my scrap room in these colors. This is totally adorable! I love that image and your color combo is great! Love the way you colored/layer the flowers to mimic the one on the dp! I do not own any PCS stamps yet..
Love the card and the bridal flowers. Do you make them or can they be purchased somewhere? I’ve got to check into Pink Cat Studio also. I’ve only been reading your blog a couple of weeks but wanted to tell you how much I enjoye it. Great Challenge Lauren! I love the color combo! Your card turned out beautiful! I love the color of copic markers, even though people have said they are similar to SU they seem brighter or something. Not sure, Umm? The sketch is awesome and I am going to try to make the challenge. Kinda nervous, being it’s my first one and all. Thanks for hosting the challenge Lauren and great job on your card! I love how pink cat is watering the flower, too cute!! Great color combo! I love that little kitty, she is adorable. Great coloring too! TFS! Your card is really cute! you always do such great work! http://www.scrapbitz.blogspot.com/ –hope you like it. 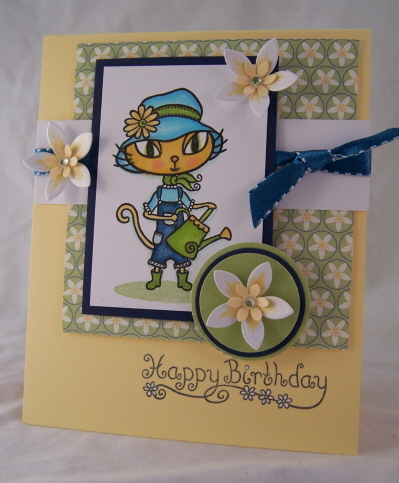 Awesome card … and talk about making the perfect embellishment to match the DP! very cute stamp, and fun coloring, love the flowers too! A fabulous card – love these stamps! Only recently found you blog but it is so inspirational, I am sure to be back soon! hi! i am brand new to pink cat but i am IN LOVE!! here is a card i made today with one of the sets i just got in yesterday! i think the colors are close to what you posted here and of course the little swirlypops for the circles! Ok so the colours weren’t working for me…lol…not sure why…but I did manage to make a card with this cool sketch….I like how it came out…not my normal stuff so THANK YOU for getting me to step out of the box! had lots of fun with your challenge! your card is adorable! First I want to say that I am so glad that alexa is feeling better…or at least pooping better, LOL. She is in my prayers. But, on to kitty…I just got my first Pink Cat Studio stamps this week…OMG!! They are so adorable! Here is the link to my blog post with the ATS pink/brown challenge using these stamps and also the card I made for your challenge. Thanks for looking! Well wanted to let everyone know I uploaded my card on SCS – MembersGallery. Look for my name Deborah Adams, its the Birthday Wishes from Fishes. I am really nervous, this is my first time entering a challenge and my first time sharing my creations with all of you. I loved this card & sketch back in August and I’ve used it for my son’s first birthday invites. Thanks for the inspiration! cool . this is wonterful ..
Each of our wide-ranging homework about the worldwide cell ﻿very quality TELEVISION FOR COMPUTER business includes discovered this Japan Pacific could commute your worldwide cell TELEVISION FOR COMPUTER market place about the to come back regarding fast manufacturing tendencies throughout nations around the world similar to Cina, Asia, Southwest Korea plus India. Cell deployments throughout most of these nations around the world will be speedily swirling along with the workers will be viewing massive options throughout most of these nations around the world that will return with the suffering ARPU.